We are kicking off our 100 Acts of Kindness Challenge! 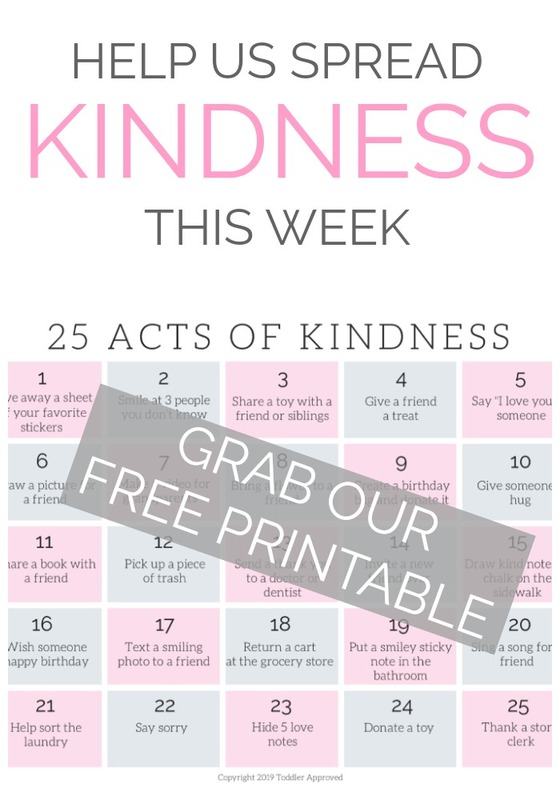 Each week on Monday for the next four weeks we will issue a simple kindness challenge for you to try. At the end of the week we'll check in to see how you did. We would also love to hear other simple acts of kindness that you try! Please share them with us! If you haven't joined our 100 Acts of Kindness Challenge Facebook group, do it! 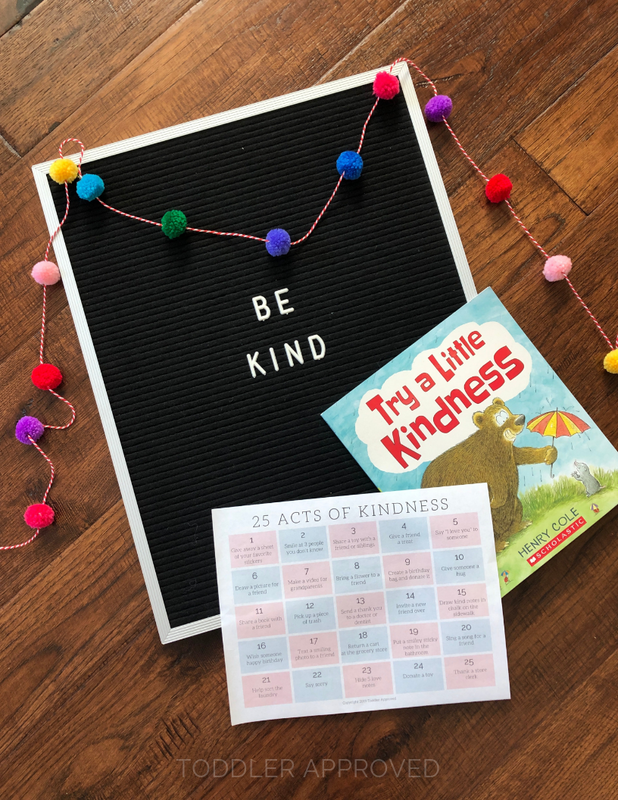 Why are we doing a kindness challenge? Because the world needs more kind people. When we do this challenge each year there are thousands of people that participate. The ripple effect of 1000 people doing 100 acts of kindness (or even just 25), is amazing. One kind act can change the world. Have you ever gone to the grocery store, or Target, and gotten a sticker for your child at the checkout? My kids are always SO excited to get any random sticker, but especially ones from the store clerks. Sometimes it changes what was a TERRIBLE shopping trip into a somewhat bearable one. 1. Pick ONE pack of your favorite stickers (have your child pick). Ideally a pack of stickers has 3-4 sheets. 2. Give away ONE sheet of stickers to THREE different people! Try and think about where those sheets of stickers might be most appreciated, and give them away there. Why are stickers so awesome? They are mostly mess free. Pretty much every toddler or kid I know loves them. There are so many different types of stickers-- so there's something for everyone. 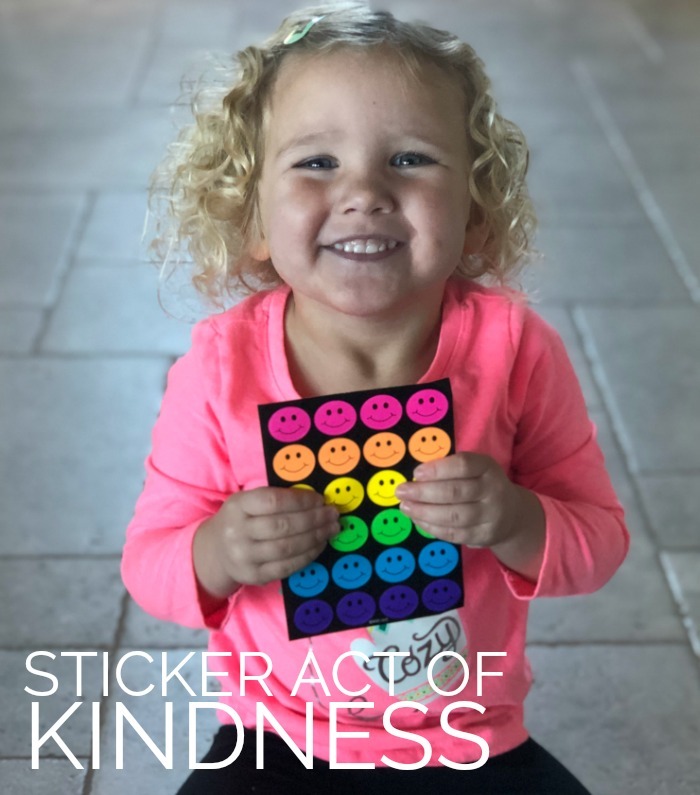 Kids can use them for all sorts of projects/crafts- like this sticker heart activity or a sticker connect the dots activity. Many kids can pull stickers off all by themselves, which is great for building their finger muscles AND makes them feel so proud of themselves! Stickers are great for keeping kids entertained when they have to wait or are traveling. We love them on road trips and airplanes. Here are some places to give away your sticker sheets or leave them! Give away stickers in a doctor's office or dentist's office! Give away stickers at the check out line at Target or the grocery store! Give away stickers in the Pharmacy line at the store! Give away stickers to a kind store clerk who usually gives stickers to your kids! Give away stickers to a kid waiting in line at a local restaurant! Can you think of any other places where you could give away or leave stickers sheets for kids (or even adults) to find? I can't wait to see what you do! Make sure to use the hashtag #100actsofkindness and tag us on social media if you post about our kindness challenge. 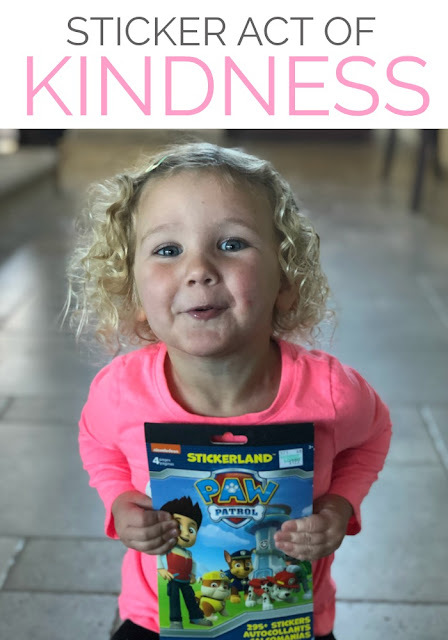 Share about it and help spread kindness to more places! QUICK TIP- Not all toddlers are going to want to give away their precious stickers. If you have one pack of four sticker sheets, keep one sheet for your toddler and have him try and pass out the other three to other kids or people. No need to make the whole outing a nightmare for you! In addition to our Sticker Act of Kindness, see if you can accomplish 24 more acts of kindness this week. That way, by the time you hit Friday, you'll have already done 25!